Take the 20 Hectare Challenge and prepare to be amazed! Trial the new 20 hectare pack at a discounted price – we have developed a simple, $35 per hectare program, which has proven to lift yield and quality while reducing the requirements for fertiliser and pesticides. We encourage you to trial this Nutrition Farming® strategy, which is proving successful across the globe. To incentivise your involvement, we are offering a prize for the winner of the 20 Hectare Challenge. Broadacre farmers are encouraged to report their successes to NTS (preferably with photos). The grower with the best result this coming season will receive a free ticket to the renowned, four-day, NTS Certificate in Nutrition Farming®. This is an internationally-acclaimed training seminar valued at $799.00. The total cost of the NTS Broadacre Boost Kit is just $700 (ex GST) or $35 per hectare. This price involves an attractive discount of 18% (i.e., these products in combination normally total $856). If you factor in your DIY rebate of $10 (to be explained later), then your total price per hectare is just $25. It’s that time again. It’s the start of broadacre planting, and those of us lucky enough to have sufficient moisture will embark upon another crop cycle and another gamble. It has been suggested that dryland farmers make TAB punters look like kindergarten kids. In the face of the increased uncertainty linked to a warming world, where water has become the new gold, this has never been more true. In all 33 countries I have visited this past 12 months, there are issues with drought and water management. At some point soon there will be a food crisis emerging, and this may result in increased prices for the cereal crops and legumes grown by those who have withstood the storm. There have been countless times during the past 22 years where I have witnessed NTS growers triumph in the dry. Even when they have not made it through, in the face of extreme moisture challenge, they have at least had the satisfaction of being the last man standing in the drought. During that time, we have fine tuned a low-cost broadacre program that offers drought resilience, increased yields and reduced problems. This program is now becoming increasingly popular in many of the 55 countries in which we work. Here, I would like to share the details of a strategy that may prove to be your beacon in the storm. The seed is essentially a tiny capsule containing a dormant plant. Like an egg, which caters for the initial requirements of the chicken, that capsule contains sufficient nutrition to germinate and establish the new seedling. That initiation is fueled by specific minerals and triggered by natural hormones, and there is a wonderful opportunity to push that natural process with the addition of these components as a seed treatment. When that starter pack is also designed to fast-track the critical relationship between the emerging plant roots and the army of soil organisms that surrounds them, we are looking at a cost-to-benefit ratio that should not be ignored. Seed-Start™ from NTS offers this essential kick-start strategy, for around $2 per hectare. It has been our experience that, once you have experienced the multiple benefits of a good seed treatment, you will never again choose a naked seed over a well-dressed alternative. Seed-Start™ contains proven seed energisers, soil-life stimulants and base nutrition to ensure that the young plant hits the ground running. 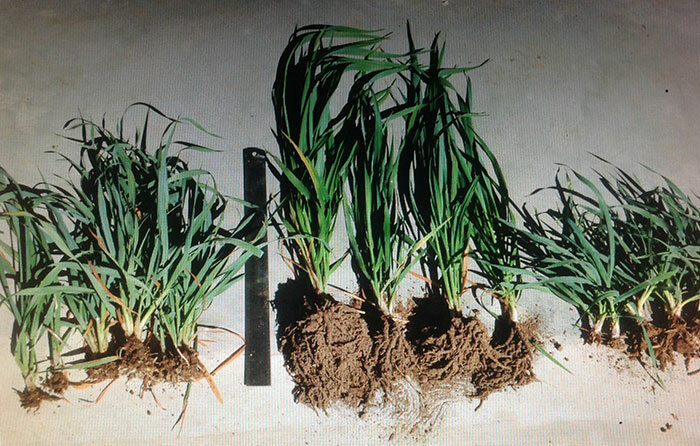 The second essential component of the NTS Broadacre Boost program involves the introduction of an organism that has been decimated in many dryland soils. In fact, 90% of these creatures are now missing from our cropping soils. Mycorrhizal fungi (AMF) burrow into the plant root and grow a network of tiny filaments, called hyphae. This massive root extension (a tenfold increase in the original root surface area) dramatically extends the scavenging capacity of the original roots. This is of particular importance when it comes to accessing immobile minerals like phosphorus and zinc. This hyphal extension can penetrate clay platelets and mine potassium from the soil. These hyphae also exude a suite of biochemicals that stimulate the plant’s immune system. However, the most important attribute of mycorrhizal fungi (AMF) relates to the building of humus in your soil. These creatures release a substance called glomalin, which is now recognised as a key stimulant that reclaims the humus-building potential of your soil. In fact, it is now known that mycorrhizal fungi are directly responsible for 30% of the humus in our soils. Humus is your saviour in the dry. A 1% increase in organic matter (humus) in the soil means that your soil can now store 170,000 litres of water per hectare that it could not previously retain. This water can not evaporate beneath the soil and the plant roots take it as they need it. The NTS product, Nutri-Life Platform®, represents a revolution in mycorrhizal recolonisation. The spores are housed in a powder that is easily applied to the seed, to ensure cost-effective inoculation. However, Platform® contains more than a mycorrhizal powerhouse. It also contains several strains of a similarly restorative organism called Trichoderma. Trichoderma offer a host of benefits, including phosphate solubilisation, cellulose digestion, bio-balancing, root growth stimulation and immune support. Platform® can be dusted on the seed at a rate of just 50 grams per hectare, at a cost of around $7 per hectare. This will not provide enough spores to inoculate every plant in the field, but it will provide enough crop response to make a Platform® seed treatment one of the best cost-to-benefit strategies available. You will also enjoy the season-to-season, cumulative benefits of having reintroduced two of the most powerful yield builders in agriculture. Many growers around the world have now discovered the multiple benefits of adding NTS Soluble Humate Granules™ to their granular fertilisers. However, most growers have yet to understand that this practice can actually be free of cost. Humic acid increases the permeability of plant cell membranes with a unique phenomenon called "cell sensitisation". This means that the plant can uptake around one third more of whatever has been combined with the humic acid. The broadacre application rate involves the inclusion of 5 kg per hectare of NTS Soluble Humate Granules™ with your granular fertiliser. The full cost of this inclusion can be deducted from your fertiliser bill because of the 1/3 improved uptake. With this DIY rebate, your humate inclusion is essentially free and you will always do better because humic acid offers much more than fertiliser magnification. Humic acid boosts root growth and stimulates beneficial fungi. It complexes unstable anions like phosphate, sulfur, nitrates and boron and it improves both their stability and delivery. This carbon-dense input also buffers the negative impact of high salt fertilisers and renders them more soil-friendly. Due to the low rates of fertiliser that many broadacre growers use, we are suggesting a more conservative reduction of $10 per hectare as the DIY rebate that reduces the total cost of this program down to just $25 per hectare. play in broadacre situations. NTS have developed two, cost-effective, high performance foliar sprays that have proven remarkably productive in several regions of the world. Even though we have already included zinc in our Seed-Start™ product, we have found that a foliar spray of zinc at the five leaf stage can be very beneficial. Hence the inclusion of 1 L of Zinc Fulvate in our successful broadacre program. Zinc is required for the production of auxins in the crop and auxins govern leaf size. Any zinc deficiency will reduce leaf size and a less than optimum solar panel will inevitably impact production. Zinc is also called the "drought mineral" because it assists the plant with moisture uptake in the dry. 50 mL/ha of Nutri-Stim Triacontanol™ is to be included with this spray. NTS Stimulate™ involves soluble, powdered concentrates of fulvic acid and kelp. Fulvic acid is known to boost photosynthesis and root growth, whilst stimulating beneficial bacteria and chelating minerals in your soil. Kelp, too, is a powerful chelating agent, but it also offers a complete blend of trace minerals from the ocean (many of which are missing from our soils). Kelp contains the highest known natural levels of cytokinins, gibberellins, auxins and betaines – substances that support every stage of plant growth. The kelp included in this blend is Tri-Kelp™, a blend of three kelp species which offer a synergistic response, outperforming all single kelp products. NTS Stimulate™ is foliar sprayed immediately before flowering at 250 grams per hectare. We also suggest that the second, pre-flowering spray should always contain Soluble Boron. Boron is a huge player in filling out the seed head and it is linked to many aspects of flowering and grain set. It is seriously lacking in the vast majority of broadacre soils, so a foliar spray immediately before flowering usually proves very productive. A very special additive is included with both of these sprays. Triacontanol is a fatty acid, extracted from the outer waxy coating of the lucerne plant. It has been described as ‘the most powerful plant growth promotant ever discovered’. It improves every aspect of plant metabolism, including the process of photosynthesis. It is a liquid product that is used at just 50 mL per hectare at a bargain price of just $4.80 per application. If you have never before tried this remarkable material, please do yourself a favour. We have also found that urea can be included with both foliar sprays if you need a nitrogen boost. The total discounted cost of the NTS Broadacre Boost is just $700 (normally $856) or $35 per hectare (excluding the boron and urea). If you apply the the DIY rebate, where you reduce fertiliser by $10/ha with the inclusion of NTS Soluble Humate Granules™ as discussed, then the total cost effectively becomes just $25 per hectare. I can promise you that there is no $25 sum you have ever invested on the farm that will offer a better return. I have just arrived back from a tour of India where wheat and rice growers have been regularly achieving a 50% reduction in fertilisers and a 30% yield increase with this Nutrition Farming® program and many report an exciting absence of disease and insects, without the use of chemicals. 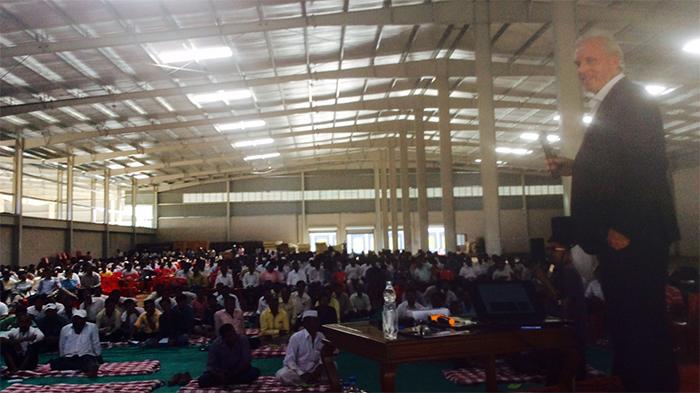 Over 1000 excited farmers attended one of the recent Nutrition Farming® seminars in India with Graeme Sait presenting in 42°C temperatures. If you have the capacity and equipment to liquid inject at planting, then you may be interested in a potent, all-inclusive, liquid fertiliser that we have specifically developed for this purpose. Springboard™ contains a complete nutrient profile to provide the key requirements for the young plant. It essentially kicks in when Seed-Start™ begins to run out of puff. This input was actually designed to be used in conjunction with mycorrhizal fungi. There can be a problem where water soluble phosphate at planting can inhibit the colonisation and development of mycorrhizal fungi. The plant encourages and feeds the mycorrhizal attachment specifically to increase access to phosphate in the soil. When the plant is provided with soluble phosphate at planting, it can shut down the development of the fungal attachment. The plant effectively starves out the fungal tag-on because it already has all the phosphate it needs at the time. Springboard™ provides natural phosphate in a liquid micronised form, which does not generate this negative side effect. This liquid also contains all trace minerals, some buffered NPK and a suite of soil-life stimulants. It has performed really well in the field over the past four seasons at application rates of 6 – 10 litres per hectare. This involves a total cost of $18 – $30 per hectare. PLEASE NOTE: All prices listed above are in AUD, excluding GST, ex Yandina, Qld. Prices valid at time of publication and are subject to change.